When a royal family heads into exile, often their jewels are quickly sold -- but not always. The former royal family of Italy has retained some significant pieces, not the least of which is the tiara from the pink tourmaline parure. The stones in this piece are often misidentified as pink topazes rather than tourmalines, but Stefano Papi and Gabriella of Savoy (daughter of Italy's last king) cleared up the confusion in their book collaboration, Jewels of the House of Savoy. But the gem-studded history of the suite is even more complicated, because the pieces of the parure were originally set with garnets instead. Unusually for a major royal tiara, this piece has stayed in Italy throughout its history. It originally belonged to Queen Maria Theresa of Sardinia, a member of the Tuscan branch of the Habsburg family, who died in 1855. Her son Ferdinand, the Duke of Genoa, inherited the tiara, but he died only a month after his mother. His wife, Princess Elisabeth of Saxony, continued to wear the tiara, eventually bequeathing it to her daughter, Margherita of Savoy. Margherita married King Umberto I of Italy, and it has remained with their descendants to this day. Prince Vittorio Emanuele, one of the current pretenders to the Italian throne, now owns the piece, and his wife, the water-skiing Princess Marina, dons it occasionally. 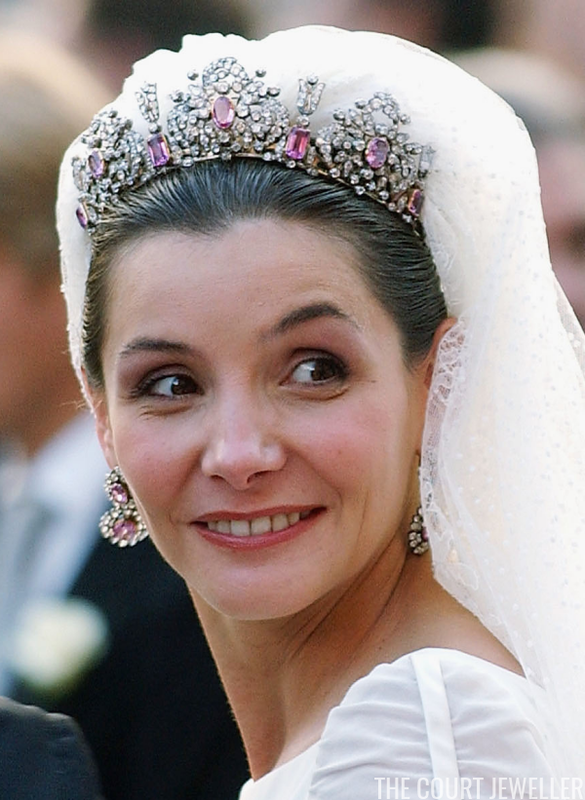 In 2004, she wore the tiara (tilted back like a headband) at the pre-wedding gala for Crown Prince Frederik and Crown Princess Mary of Denmark. 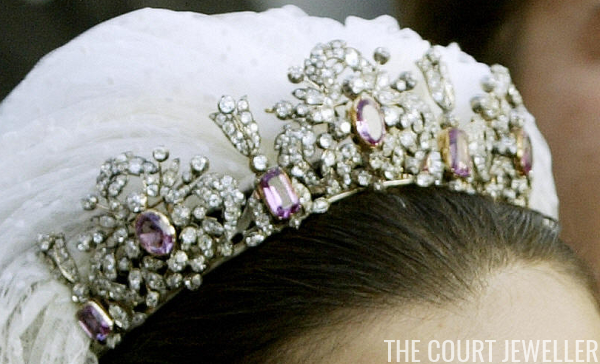 The tourmaline tiara had its most significant public outing in recent years at the wedding of Vittorio Emanuele and Marina’s son, Emanuele Filiberto, to French actress Clotilde Courau. She wore the tiara with earrings from the coordinating parure. 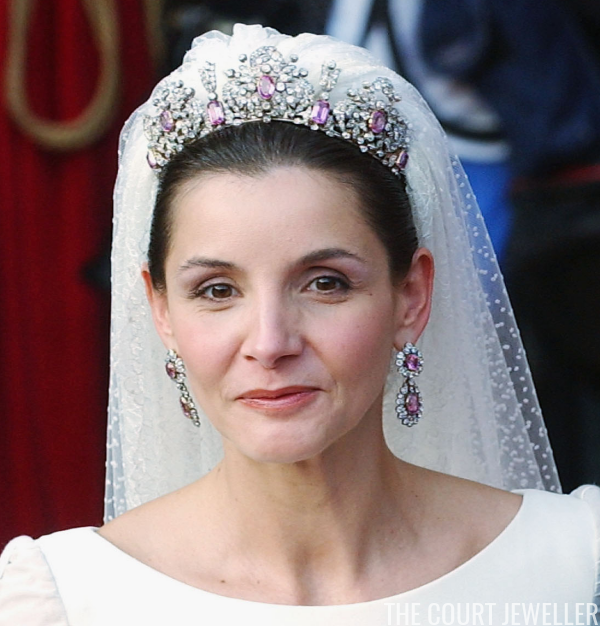 Clotilde also wore the earrings at the Monegasque princely wedding in 2011. This outing demonstrated the parure's versatility, as different shaped drops can be interchanged for different looks.